PHILADELPHIA (WPVI) -- A contest is giving one lucky Philadelphia Eagles fan the chance to win Carson Wentz's pregame cleats and a video chat with the quarterback. The contest is a collaboration between Greenroom, the celebrity video chat platform co-founded by Dr. Drew Pinsky, and CrowdRise, part of GoFundMe. Fans who donate to Wentz's AO1 ("Audience of One") Foundation have the opportunity to win. During the video chat, Wentz will sign the cleats. 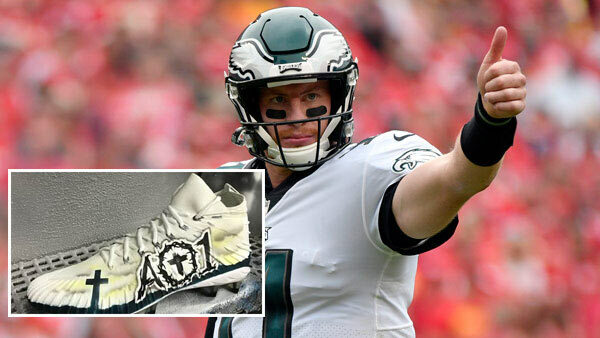 "I am excited for this opportunity to interact directly with a fan and somebody who supports the AO1 Foundation," Wentz said in a statement. The pregame cleats were worn by Wentz during Weeks 1 to 3 of the season. These games were at the Washington Redskins, at the Kansas City Chiefs, and home versus the New York Giants. "This is a breakthrough for fans and players," said Pinsky. "Fans get unprecedented personal access and players get an easy new way to raise funds for their cause." The AO1 Foundation focuses on three main objectives that reflect some of Wentz's passions in life. The foundation supports youth in the Philadelphia area by providing service dogs to assist with their development and quality of life. It also provides hunting and outdoor opportunities for individuals with physical challenges, the underserved and military veterans living in the Midwest. The AO1 Foundation looks to care for and provide food, shelter and educational opportunities for underprivileged youth living abroad.